The Canadian International Development Report (CIDR) is The North-South Institute’s flagship publication. The report contains policy briefs by leading experts on pressing issues in international development. These briefs offer lucid insight to assist decision makers in Canada. In 2013, the focus of the CIDR was on the governance of natural resources in Africa. Each contribution, while dealing with the same general topic, approaches the subject from a different angle. The issue of financing is a prominent theme that runs through the briefs: the rise of the BRIC countries, in particular China, has opened up new means of foreign investment. However, the briefs also acknowledge the changes taking place from within the continent, including the the post-2009 shift towards African agency. Preface, by Hany Besada and Timothy M. Shaw. Extractive Sector Regulations and Policy in Africa: Old Practices and New Models for Change, by Chris W. J. Roberts. Emerging Economies and Africa’s Natural Resource Curse: Avoiding the “Resource Curse” and Building More Resilient Societies, by Fantu Cheru. Post-2015 Natural Resource Governance in Africa: African Agency and Transnational Initiatives to Advance Developmental States, by Timothy M. Shaw. 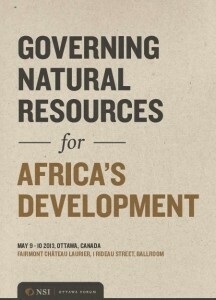 Canada and Africa’s Natural Resources: Key Features 2013, by Aniket Bhushan. Global Development Trends 2013: An Analysis of Data Available on the Canadian International Development Platform, by Aniket Bhushan.